Pyongyang, North Korea (CNN) -- North Korea's reclusive leader, Kim Jong Il, made another rare public appearance Sunday with his youngest son at a massive military parade billed as one of the largest in the nation. Dignitaries from around the world, including China, Russia, Nepal, Poland, Austria and Mongolia, attended the event. It featured 20,000 military personnel marching in lockstep and huge pieces of military hardware -- including tanks and missiles -- rolling along the parade route as part of North Korea's celebration marking the 65th anniversary of the Workers' Party of Korea. Video from the event showed thousands of military personnel erupt into applause and chants as the Kims appeared in the capital to start the parade. Fireworks lit up the sky and, according to the state-run KCNA news agency, "the ever-changing sea of dancers and flowers and ships and boats (were) decorated with multi-color lights." According to KCNA, the gala was made up of performances with names such as "Country where leader's desire has come into full bloom" and "Party is guide of victory." 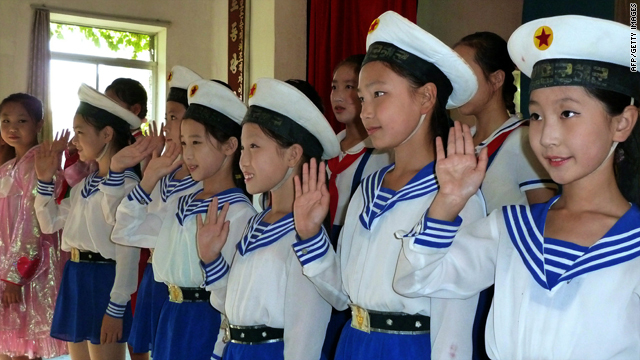 Brass bands played songs including "Song of General Kim Jong Il," KCNA reported. "It's an annual holiday, but in effect this is an elaborate coming out party for the man who will be the next leader," said CNN's Alina Cho, referring to Kim's youngest son while reporting from the parade. The parade began in the Kim Il Sung Square, named for Kim Jong Il's father and North Korea's founder. The United States believes Kim Jong Un has been tapped to replace his ailing father as North Korea's leader. Little is known about Kim Jong Un. He is thought to be 27 or 28, is believed to have been schooled abroad and is thought to be capable of speaking some English and German, and possibly some French. He is said to have a fondness for Michael Jordan and James Bond. In a move that surprised North Korea observers, Kim Jong Un appeared to be wearing civilian clothes instead of his military uniform and medals, even though he had been named a four-star general last month. "This is ... Kim Jong Il trying to make sure that senior military officers are not offended by someone who just got his start," said Gordon Chang, a North Korea expert and columnist for Forbes.com. "It shows he needs to massage this process." In a rare embrace of the media, Pyongyang invited about 60 journalists from around the world to cover the weekend's festivities, Cho said. "We were quite hastily invited at the middle of last week," she said. "We knew something big was happening but we weren't entirely sure what." Cho said that security is tight and that even the news media's government minders are being checked by security personnel -- along with Cho's notebook and pen. Sunday's parade encompassed units of the three services of the Korean People's Army -- the Korean People's Internal Security Forces, the Worker-Peasant Red Guards and the Young Red Guards -- according KCNA. On Saturday, Kim and his heir apparent appeared at Pyongyang's May Day Stadium as part of the Arirang celebration. The event featured hundreds of gymnastics and dance performances. Participants spent up to eight hours a day training and preparing for the occasion. Performers danced enthusiastically for the crowd in the packed stadium. 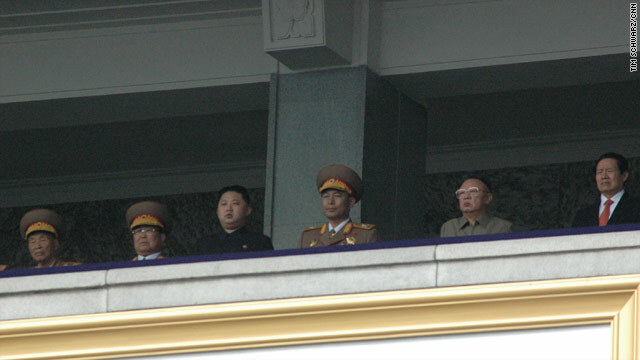 Kim Jong Il and Kim Jong Un could be seen sitting in a private box removed from the masses, flanked by military officials. Electricity was on throughout Pyongyang on Saturday, Cho said, an unusual occurrence in power-starved North Korea. The spare-no-expense celebration will likely be frowned upon by many ordinary North Koreans, Chang said. "With the North Korean economy trending downwards, with poverty and destitution, there's got be the question of the nature of the regime," he said. "They're going to look at this and say, 'Why don't I have clean water? Why don't I have food? How can they afford all of this?'" Chinese President Hu Jintao sent Kim Jong Il a congratulatory message Saturday, commending the party for "overcoming difficulties and risks and arduously struggling to continuously make eye-catching achievements in its socialist revolution and construction cause," China's state-run Xinhua news agency quoted Hu as saying. Hu also praised the relationship between North Korea and China, and pledged to make "it an unswerving policy to continuously strengthen and develop bilateral friendly and cooperative ties."